I Learned a Caulking Trick! I have a goal of repainting the playroom soon…. Jim says it has to wait though until we get the hall closets finished, the floor and door trim up in the hall extension (and in Trevor’s room, and Riley’s room), and we have to get all the closet doors hung, and our closet door stained and hung….and the patio ceiling painted….THEN I can paint the playroom. Hmmmm, after listing all that out it doesn’t look like I’ll be doing that anytime soon, does it!? Anyway, I’m already dreading repainting the walls around the windows. We have wrapped sheetrock and it was a bear to caulk and get a clean line…as you can see from these images I did NOT get a clean line! 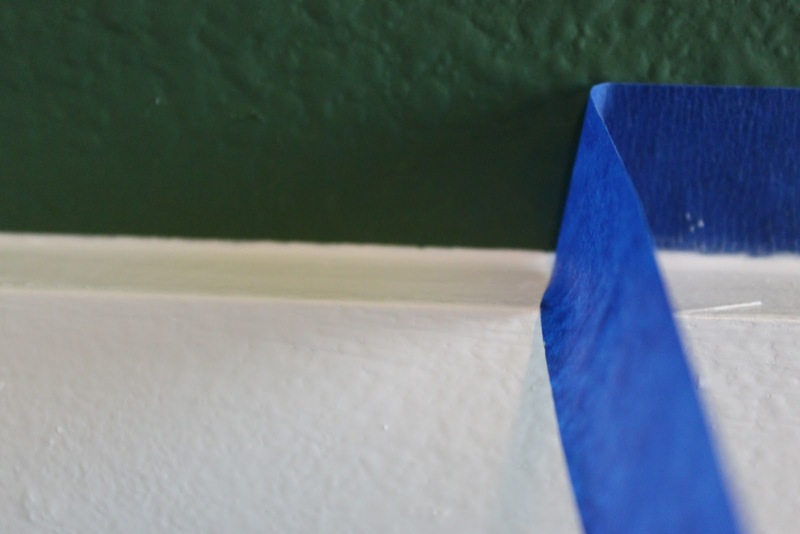 While reading someone’s blog- where she installed some wood trim on the walls in her son’s room, and wanted a clean caulked edge- this is the tip she shared….and I’m sooooooo gonna use it. Well that seems like an obvious idea, doesn’t it? Ha! 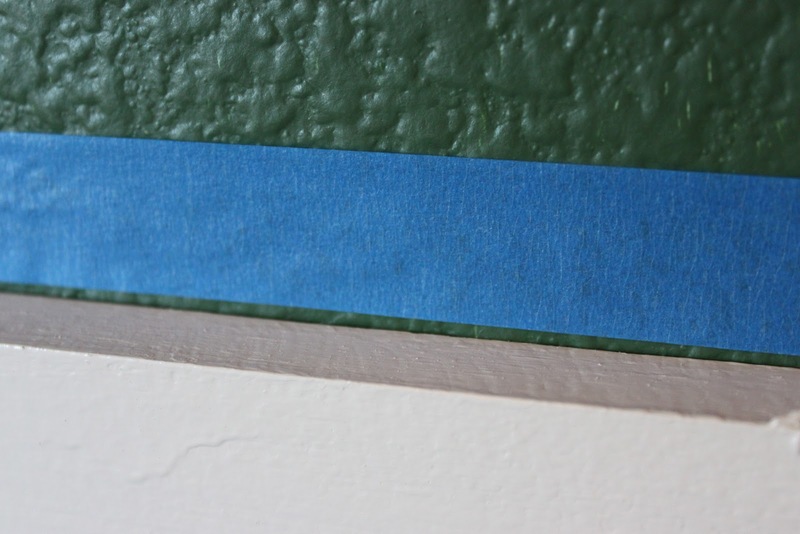 She suggests you run a strip of painters tape just a smidge away from the ‘corner’ that needs to be caulked. In the image below she’s caulking above some chair rail she installed in her son’s room. 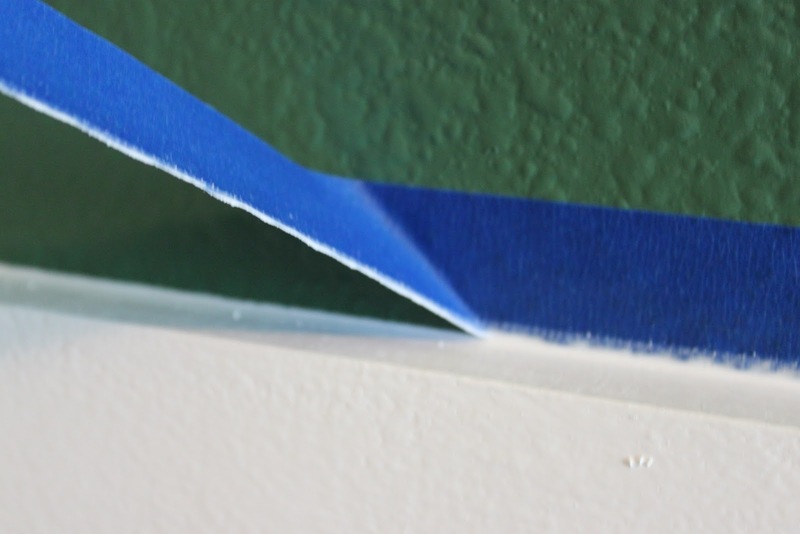 Caulk, and smooth with your finger then immediately remove the painters tape. You now have nice, clean lines! Well that seems almost TOO easy! Certainly a much cleaner line than I got when I did my windows! Granted, I think windows do need a thicker caulk bead, but this trick here looks like it will work really well for caulking around door trim, the outside trim for windows, baseboard wall/floor trim, the chair rail we installed in Riley’s room (to give it a more “finished” look). I think I see caulking in my future now…. ugh. Update: I did it! To see it in action click here. Next Next post: Step 3 to 5 to 7?